Since Facebook's inception and rapid ascent to global prominence, many users have doubtlessly experimented with ways to play practical jokes on their friends or to get a certain message across, depending on their reasons for using the social networking site. One simple yet highly amusing method has been for a user to change their birthday periodically in order to repeatedly generate the massive flood of greetings left on their walls from well-meaning "friends". All that is required to pull this off is a simple profile modification and a sufficient number of gullable and/or forgetful friends. Due to Facebook automatically displaying birthday notifications on every friend's homepage, this can also be a highly effective way to generate clicks on your profile and attract attention, even if some people don't write on your wall or actually see through your little ruse. To test out this practice, founder of Colnect conducted a small experiment whereby he and an associate entered a fake "Facebook birthday" into their profiles on two separate occasions within a 4-5 week period. One interesting stat he wished to uncover was how many "friends" would obliviously send him birthday greetings on both days. As he observed, his Facebook friends list is a particularly fascinating test group, since it consists of people he has fairly close personal relationships with and those who are entirely virtual connections made to promote his collectors web-site. In the end, he found the results of his skullduggery both humourous and befuddling. On his original fake birthday, he received a total of 63 birthday wishes on his Facebook Wall and Inbox, while his associate's profile accepted 47 such misplaced greetings only a couple of days following his non-existent celebrations. Perhaps most interesting is that he also received three "Happy Birthday" phone calls from real world friends who believed the information on Facebook, despite having attended his real birthday celebrations only six months earlier. "I didn't realize how forgettable my party was," the chairman of the collectibles web-site quipped. In addition, his 2nd fraudulent Facebook birthday generated 62 well wishes, including 26 repeat offenders from the first day barely one month prior, while the second time around his associate's profile received 57 greetings and 17 duplicate wishers from before. 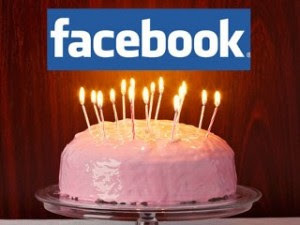 Although the direct ramifications of this may be trivial, it does perhaps illustrate a tendency of users to automatically accept information displayed on Facebook as absolute fact, even when contrary evidence is readily available (in the cases of those who wished the same person "Happy Birthday" twice within a matter of weeks and his real world birthday party attendees). Savvy Facebook users and spammers could easily utilize this fact to manipulate others for far more cynical purposes. It also brings up the question as to why Facebook lets its members change their birthday an infinite number of times, given that by definition it's a static piece of information. While it's understandable that someone could lie or mistakenly enter an incorrect birthday when they first registered and wish to correct this, allowing users to alter their birthday on multiple occasions seems to be opening the door to such blatant shenanigans. So what's your opinion on this? Should FaceBook limit the ability to modify one's birthday?